This chapter contains a simple tutorial for image-based validation. Before working with this example, make sure you’re familiar with the ⇢ basic concept of test validation. To follow along with this tutorial, download the sample solution file from the link below. 1. Start the demo application. 2. Click the Image-based automation tab. 3. Make the image visible. 4. Verify that the image is displayed. 5. Exit the Demo Application. Create a desktop-test solution using the Solution Wizard and in step 2 of the setup, select the Demo Application as your AUT. Demo App selected as AUT and is launched automatically when you start recording. When the Solution Wizard has finished, click the Recording1 tab in the Ranorex Studio working environment. In the recording module view of Recording1, click RECORD. Ranorex Studio is minimized to the taskbar automatically. The application under test comes into focus. Click the tab Image-based automation. To make the image appear, click the checkbox Show image. The goal of the example validation is to verify whether the image of the cat appears when the checkbox is selected. Since this requires us to validate an image, it’s an image-based validation. In the Recorder controls, activate the switch Image based recording. Click Validate. The Recorder pauses recording and switches to image-based validation mode. Mouse over the image of the cat. A purple frame follows your mouse movement. Once your selection matches the image, click it. The UI element tree represents the hierarchical GUI structure of the application. You can click a different UI element to select it for validation, if desired. All the attributes of the selected UI element appear in this area. Use the screenshot to quickly check whether you’ve selected the correct UI element. Define the image that will be used for the validation. For our example, simply leave everything as it is and click OK to confirm. 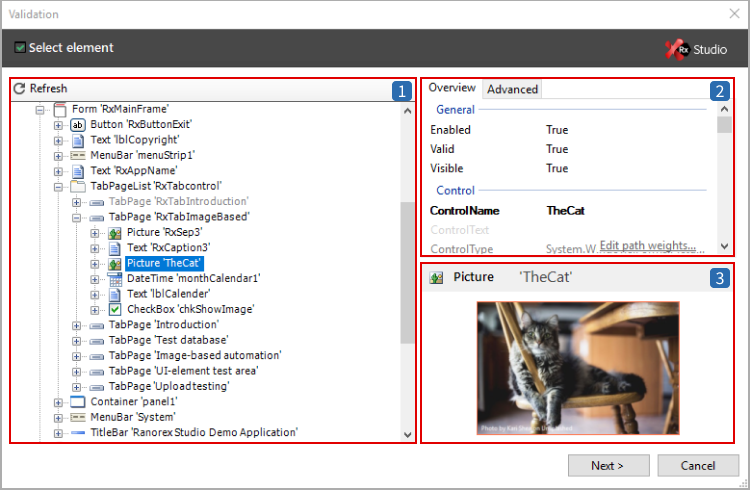 The Image tab is selected in the validation dialog instead of the Attributes tab. Draw a rectangle to select a part of the image when using the “Contains” validation mode. Contains: determines whether the validation image is contained in the actual image found during the test. Compare: determines whether the validation image and the actual image found during the test are the same. Once you’ve finished the validation action, Ranorex automatically continues recording. The next step is to end the test recording. After recording stops, you are returned to Ranorex Studio. You’ll see the actions table with three recorded actions. Action #3 is the validation action. This operator identifies the type of validation to perform. There are nine different validation type operators. Validation type operators for image-based validation. A detailed description of all validation match operators can be found in > Ranorex Studio fundamentals > Actions > ⇢ Action properties. The validation screenshot to which the actual image found during testing will be matched. The repository item linked to the action, i.e. the UI element on which the validation is performed. If Screenshot1 is contained (ContainsImage) in the UI-element referenced by the repository item TheCat, THEN the validation returns the value ‘True‘.